Life doesn’t stop for pictures. 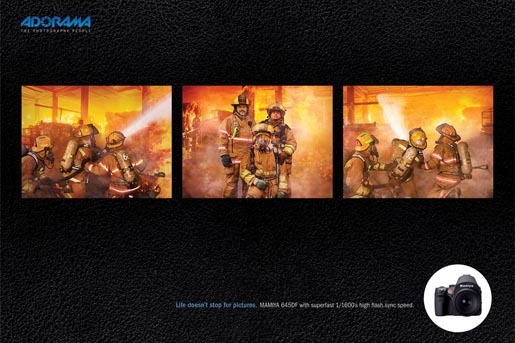 That’s the message contained in this print advertising campaign for photography store Adorama, featuring the Mamiya 645DF camera superfast 1/1600 second high flash sync speed. Three print ads show action and posed photographs featuring rioters and riot police battling in the streets, firemen fighting a fire, and security guards chasing a streaker. 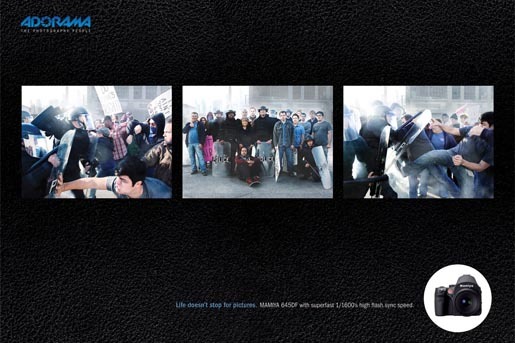 The Riot, Fire and Streaker ads were developed at DDB New York by creative director Eric Silver, art director Chuck Tso, photographer Craig Cameron Olsen, with retouching by John Cason and Aaron Needham.